Studied with Edward Walker at the Royal College of Music and made further studies with Caratgé, Rampal and Moyse in Paris. He had two seasons with the Scottish National Orchestra playing second flute before reaching Manchester in 1956 to take up the position of principal with the BBC Northern Orchestra. In 1959 he returned to the Scottish National as principal. Another stint as principal with the BBC Northern Orchestra (1961-66) followed along with much playing of chamber music. 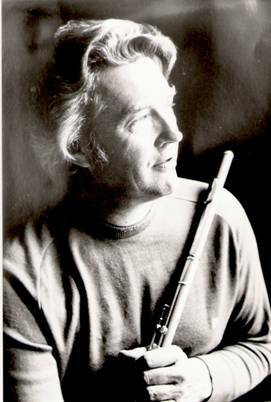 On leaving the Hallé in 1967 he took up the position of principal flute with the London Symphony Orchestra remaining until 1987 when his interest in teaching took him to the USA as Head of Flute Studies at Indiana University. He also taught flute at the Guildhall School of Music from 1987 -1993 and continued to appear with the Barry Tuckwell Wind Quintet. In 1993 he made his way back to Manchester where he was Head of Flute Studies at the Royal Northern College of Music.